The University of Notre Dame will host an open house for its new off-campus Center for Arts and Culture on March 27 (Wednesday). Tours of the center will be offered from 10 a.m. to 2 p.m. and 3 to 7 p.m. 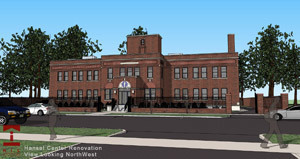 The fully renovated building will provide space for community programming including after-school tutoring, public lectures, art classes, a summer youth innovation camp and other education enrichment opportunities. Located at 1045 W. Washington St., South Bend, it is across the street from the Indiana University South Bend Civil Rights Heritage Center at the Engman Natatorium, and will become a part of the growing west-side cultural corridor that includes the Studebaker National Museum and the Northern Indiana Center for History. Light refreshments will be served at the open house. Parking is available on the street or at the IUSB Civil Rights Heritage Center. Originally published by Brittany Collins at news.nd.edu on March 22, 2013.